Lara Gut wins the first race of the season in Soelden and conquers her first world cup win in Giant Slalom. 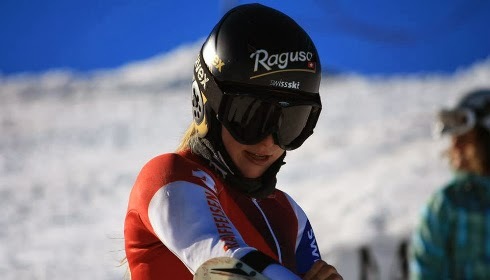 The Swiss was already in the lead of the race after the first run with a margin of over Eight tenths of a second on Viktoria Rebensburg and Anna Fenninger. The biggest surprise of the day came from Tina Maze, though. The Slovene, winner of last year’s overall and Giant Slalom globes, was surely one of the favourites for the win today. Nonetheless she looked quite slow and her preparation may have changed from last year, when she was unstoppable in the early races. She seemed to be in far from her best form and finished sixth after the first run, before plummeting down to 18th position at the end of the race. In the second run the rise in the temperature caused a big change in snow conditions and the course deteriorated constantly. That situation helped the comeback of athletes like Nadia Fanchini, second at the start in the final run, who scored the best partial time finishing 14th. Right before the disastrous second run of Maze, another Tina, Weirather, scored an amazing run to secure a place into the top ten. Liechtensteiner Weirather qualified for the second run despite her high bib -37- and in the second run she tamed the bumps and waves on the course like no one else could within the top ten. Her run let her gain two more positions and she scored her career best result in the discipline, a great accomplishment after the long series of injuries she has suffered in recent years. The fight for the podium was a contest of four skiers, with Kathrine Zettel the only one close to the best three girls of the first run. The Austrian skied a terrific second leg, painting great lines down the steep middle section of the Rettenbach glacier. Neither compatriot Fenniger, nor German Rebensburg could finish ahead of her. In contrast to this, Lara Gut went down with the sole idea of winning and her performance did not fail her expectations. Despite a couple of mistakes in the middle section, the Swiss never stopped trying to accelerate after every turn and in the end this paid off with a terrific win. Her first in Giant Slalom. As usual, women’s skiing goes break and will come back in three weeks time with the Arctic race of Levi’s slalom, Finland.